Madras and Mountain View had a Central Oregon showdown on Friday and the Cougars bested the Buffs 7-2 in Bend. Mountain View was able to hit the ball very well and scored four runs in the first two innings. The Buffs were held hitless in the first three innings of the game until Kody Zemke was able to hit a single to center in the fourth inning. The Buffalos scored their first run in the top of the fifth, when Carter Dunten laid down a bunt. The bunt was fielded by the Cougars, but an overthrow to first scored Carson King. Mountain View responded with two runs in the fifth inning. In the top of the seventh inning, Liam White hit an RBI double, hitting in the second run for the Buffalos. The Cougars were able to get 11 hits during the game, compared to the Buffs' three hits. Both teams committed only two errors, but the White Buffalos struck out 12 times in their loss. Jordan Mitchell went 1-for-2 on the day, while both White and Zemke went 1-for-4. 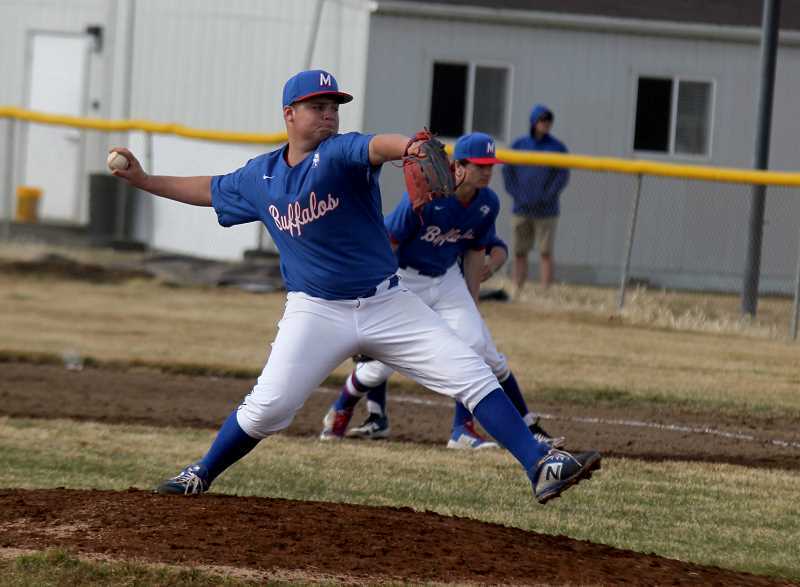 The Madras White Buffalo baseball team traveled to face Marist Catholic, in Eugene, on Wednesday, March 20, and a mix between the bats not connecting with the ball and the Spartans not committing a single error, saw the Buffalos lose 9-0. In the first inning, both teams were held scoreless, but the Spartans scored one run in both the second and third innings, taking a 2-0 lead heading into the fourth. Marist Catholic scored a combined seven runs in the fifth and sixth innings and defeated the White Buffalos. John Oliver pitched for the Spartans and through six innings, allowed three hits and struck out nine Madras batters. Junior Liam White pitched well for the White Buffalos, only allowing one hit through 2.2 innings, while also recording four strikeouts. The Buffalos struggled a bit in the field, recording seven errors as a team, and at the plate, struck out 12 times. Zemke went 1-for-3 on the day, while King and Trent Mitchell ended the night 1-for-2 batting. The Buffalos also traveled to Hidden Valley, losing to the Mustangs 10-0 on March 18. Jordan Mitchell recorded a hit for Madras in the first inning, but that would be the only hit the Buffalos had the rest of the game. The Mustangs scored three runs in the first inning and six runs in the third inning, taking a big 9-0 lead, heading into the fourth. In the bottom of the fifth inning, Hidden Valley scored a game-ending run. Nate Vidlak and Noah Stone pitched a very good game for the Mustangs, combining for 11 strikeouts through five innings, only allowing one hit. In the White Buffalos' season opener, Madras only needed six innings to dispatch the Sisters Outlaws. The Buffs scored five runs in both the third and fifth innings to beat Sisters 12-2, in a game played at Sweet Home. Madras was down 2-1 early, but a walk by the Sisters' pitcher allowed the Buffalos to tie the game at 2-2. Dunten, a freshman, and Mitchell, a sophomore, each hit a two-RBI single, scoring four runs. King, also just a freshman, and another sophomore Penaloza both hit RBIs in the sixth inning, helping the Buffalos beat the Outlaws 12-2. Madras recorded seven hits as a team and only had one error on the day. Dunten went 2-for-3 with two RBIs, with a walk, and scored two runs to lead the White Buffalos. Mitchell ended the night 2-for-4 with two RBIs and two walks, while Penaloza went 1-for-2 with two RBIs. Reece White also ended the night 1-for-2 at the plate, while Liam White and Zemke went 1-for-3 on the day. Mitchell, Reece White and Michael Belgard all pitched for the Buffs and the three combined for seven strikeouts, only allowing three hits in six innings. "There is not a lot of experience returning and varsity baseball is pretty tough if you haven't done it yet," head baseball coach Sam McCormick said. "We are just trying to feel ourselves out and gain some confidence. Baseball is a really hard game to do that. Your confidence and attitude is based on your preparation, instead of your success because in baseball, success comes in a lot of different forms, but not necessarily a positive one in the scorebook." "We are getting games under our belt, now being able to play outside a bit," he said. "Every day we are outside, we are just teaching the game the way it needs to be taught. We are trying to prepare these guys for every situation that may come during a game, so they know what to do. Our goal right now is more long term and less short term." The White Buffalos host a spring break tournament March 27-29, playing at 9 a.m. Thursday and Friday. The rest of the game times will be decided by wins and losses. "Our tournament is looking awesome," McCormick said. "The field looks beautiful and we have seven other clubs coming over to play. No one has backed out yet, which is always a positive. It will be fun just to keep playing and finally being able to play at home will be really nice. We have been burning up the highways to far and that can take a toll on everyone."